Bob Baffert has three likely starters for the Grade I Malibu Stakes at Santa Anita on opening day next Tuesday, Dec. 26, headed by two-time Grade I winner McKinzie, who showed he is at the ready with a six furlong workout Sunday in a bullet 1:13.20, fastest of 23 drills at the distance, the average time of which was 1:15.43. The bay son of Street Sense is coming off a disappointing performance in the Breeders' Cup Classic at a mile and a quarter, but Baffert feels the seven furlongs of the prestigious Malibu, which offers $300,000 in prize money, will be ideal. “He worked really nice,” the two-time Triple Crown winning trainer said on an overcast Monday morning at Clockers' Corner. “He's doing really well. I freshened him up a little after the Breeders' Cup (Nov. 3), and in retrospect, he wasn't ready to go a mile and a quarter . . . but I thought I had him back. “The Breeders' Cup took me out of my normal program. It's a lot of money and it seemed right, but he just didn't show up. I like the way he's training here for seven-eighths. McKinzie captured the Grade I Pennsylvania Derby on Sept. 22 and was promoted from second to first via disqualification of stablemate Solomini in the Grade I Los Alamitos Futurity last Dec. 9. Baffert has Mike Smith booked to ride McKinzie, with Drayden Van Dyke on Ax Man, also ticketed for the Malibu along with Solomini. “He's doing really well,” Baffert said of AxMan. “We cut (gelded) him. He had a meltdown at Churchill Downs (for the Matt Winn last June), so we gave him some time off and he's been working exceptionally well. “Solomini is coming off a layoff and has been freshened up. He's an off-the-pace sort. Baffert will be seeking his third Malibu victory, having won it with Shakin It Up in 2013 and The Factor in 2011. 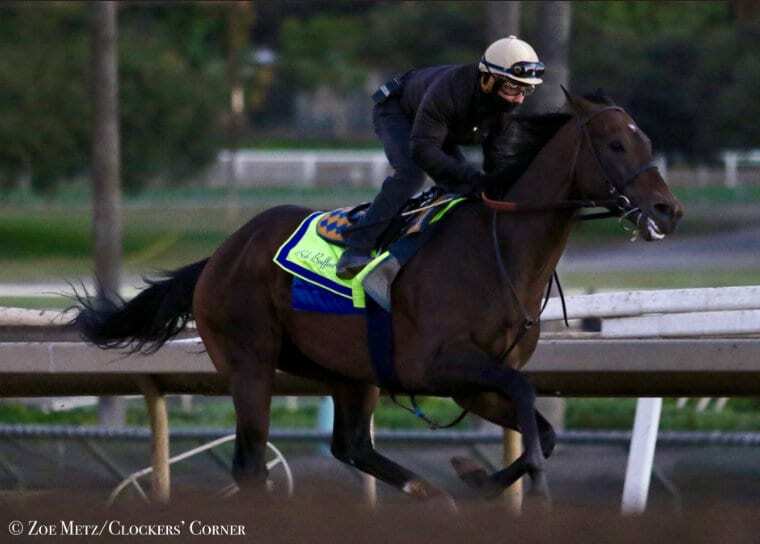 This entry was posted in NL List, Racing and tagged ax man, Bob Baffert, malibu, Malibu Stakes, mckinzie, nero, santa anita, santa anita park, solomini, Street Sense by Paulick Report Staff. Bookmark the permalink.